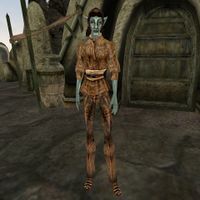 Aryni Orethi is a Dunmer commoner living in Ald'ruhn. You may be able to convince her to move to Indarys Manor in order to help the men there find wives during the construction of your Stronghold. She is wearing a common shirt with matching pants and shoes and carries a key to her chest. Aside from her natural resistance to fire and the sanctuary provided by her ancestors, she knows no spells. "Do you think I'd marry just anyone?" (Disposition at least 60) "I must admit I'm interested in you [sic] offer. But not quite interested enough to accept." (Disposition at least 90) "Okay. I might as well try looking around Indarys Manor. There certainly aren't any real men around here." "You've convinced me, %PCName. I'm moving to Indarys Manor." "Yes, I have no [sic] chosen my husband yet, but I think I will settle down here at Indarys Manor." This page was last modified on 20 March 2014, at 20:12.